How many Catholics are at Mass on a weekly basis? This percentage varies depending on if one is interested in those who attend every week and those who are at Mass on any given weekend. There are also important differences in how one conducts the poll that generates these numbers. CARA has conducted 19 CARA Catholic Polls (CCP), national surveys of adult self-identified Catholics, since 2000. Some of these have been by telephone and others have been conducted online using Knowledge Networks national panel. There are important and interesting differences between the results of Mass attendance questions from CARA’s online self-administered polls and CARA's telephone polls that are strongly related to the effects of the presence of an interviewer. These differences are not limited to Mass attendance and generally are observable for any socially desirable activity from financial giving and frequency of prayer and confession. 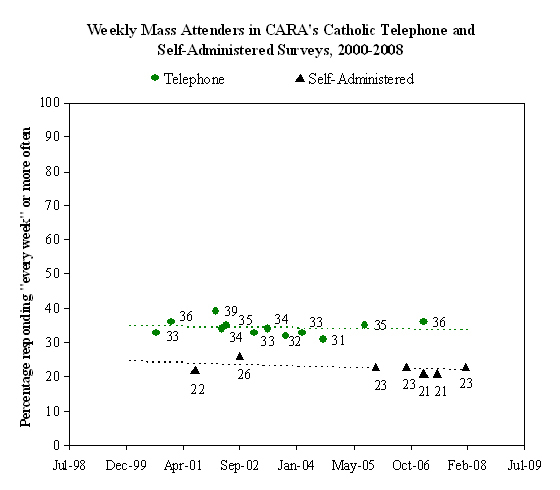 CARA’s self-administered surveys consistently show lower levels of Mass attendance than what is exhibited typically in CARA’s telephone polls. Survey researchers have long understood that the personal interaction between interviewer and respondent can create over-reports of certain activities (such as voting or giving to charity) that are considered socially desirable. Responses to questions regarding attendance at religious services are known to be biased toward estimates higher than actual attendance as measured by head counts. 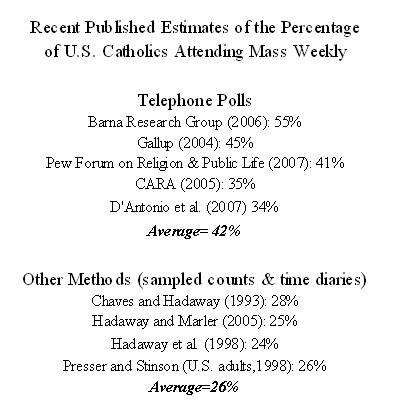 Below we show varying estimates of Catholic weekly attendance using telephone polls and other methods such as head counts and time diaries. CARA's self-administered surveys use methods that do not require a human interviewer--respondents are answering questions as they appear on-screen (either through a computer or on their television using MSN TV). Self-administered surveys, such as this, are known to reduce over-reports for questions that have socially desirable response sets (encompassing attitudes people believe they “should” have or behaviors they feel they “should” do), producing results that more closely reflect actual behavior than estimates derived from telephone polls. 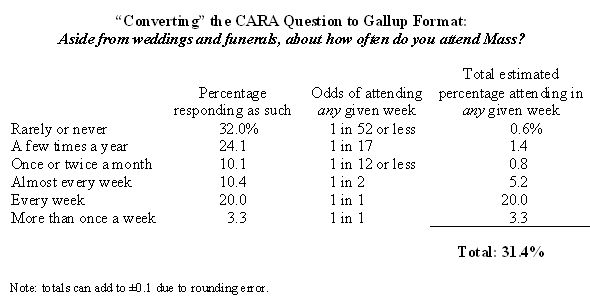 The estimated percentage of Catholics attending Mass every week using the responses to CARA's self-administered surveys are more consistent with what is found in estimates of the attendance of Catholics derived from other methods, such as sample-based head counts and time diary studies. As the figure below shows, results from 12 CARA telephone surveys and seven CARA-Knowledge networks surveys (using self-administered methods), produce no statistically significant changes in weekly Mass attendance between 2000 and 2008 by either method of polling. All variations are within the sampling margin of error. The difference between the two methods of polling is consistently about 8 to 14 percentage points for those who say they attend weekly or more often. On average, in CARA's self-administered surveys 22% to 23% percent of adult self-identified Catholics say they attend Mass on a weekly basis (i.e. every week). Some other surveys, such as those conducted by Gallup, ask about religious service attendance in any given week (e.g., the last seven days). In the table below, we convert the responses from the CARA question and estimate the percentage of Catholics that attend Mass in any given week rather than every week. This is estimated to be 31.4%. By chance one might expect about 2% of those who say they “rarely or never” attend Mass to have attended Mass in any given seven-day period (odds of 1 in 52). If one takes the 32% of Catholics responding in this manner and multiplies it by 2%, one can estimate that 0.6% of Catholic Mass attendance in any given week is made up of those who say they "rarely or never" attend Mass. This same calculation can be done for each category of responses that indicate less than weekly attendance. Gallup estimates that 45% of Catholics attend Mass in any given week. CARA estimates this to be about 13 percentage points lower. This is consistent with expectations as Gallup polls use an interviewer over the phone and are thus influenced by social desirability bias. Note: Knowledge Networks panel has been shown to be representative to well within 1 percentage point to the U.S. Census Current Population Survey (CPS) demographics for gender, age, race and ethnicity, education, and region. See: Baker et al. (2003), “Validity of the Survey of Health and Internet and Knowledge Networks Panel and Sampling,” Stanford University and Krosnick and Chiat Chang (2001), “A Comparison of Random Digit Dialing Telephone Survey Methodology with Internet Survey Methodology as Implemented by Knowledge Networks and Harris Interactive,” Ohio State University. The panel is updated on a quarterly basis and those persons who are sampled and asked to join the Knowledge Networks panel receive subsidized Internet access and other incentives. For those who do not own computers, Knowledge Networks provides a television-based Internet system (MSN TV) for free. These steps ensure that the Knowledge Networks panel is as reflective as possible of the national population and that it is not biased towards those who have pre-existing access to the Internet. Mark Chaves and James C. Cavendish. 1994. 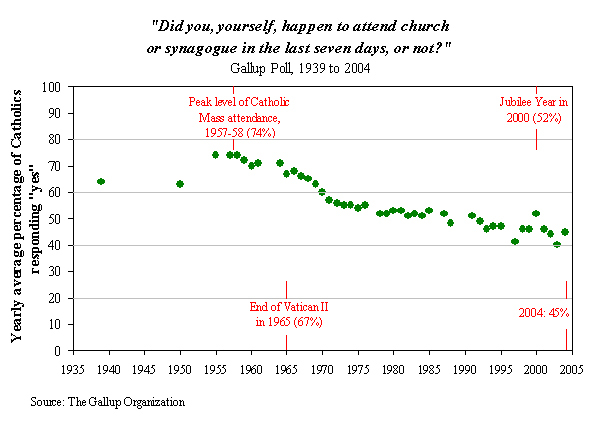 "More Evidence on U.S. Catholic Church Attendance." Journal for the Scientific Study of Religion. 33: pp. 376-381. Stanley Presser and Linda Stinson. 1998. "Data Collection Mode and Social Desirability Bias in Self-Reported Religious Attendance." American Sociological Review. 63: pp. 137-145. C. Kirk Hadaway and Penny Long Marler. 2005. "How Many Americans Attend Worship Each Week? An Alternative Approach to Measurement." Journal for the Scientific Study of Religion. 44: pp. 307-322. Research in the Media: "Many Women Targeted by Faith Leaders"
Recently the Washington Post published a story entitled "Many Women Targeted by Faith Leaders"
This research is based on questions from the 2008 General Social Survey (GSS). "One in every 33 women who attend worship services regularly has been the target of sexual advances by a religious leader." "The study, by Baylor University researchers, found that the problem is so pervasive that it almost certainly involves a wide range of denominations, religious traditions and leaders." "'It certainly is prevalent, and clearly the problem is more than simply a few charismatic leaders preying on vulnerable followers,' said Diana Garland, dean of Baylor's School of Social Work, who co-authored the study." "Now think about church, synagogue, or other religious settings. Since you turned 18, have you ever found yourself the object of sexual advances or propositions from a minister, priest, rabbi, or other clergyperson or religious leader who was not your spouse or significant other?" "Sometimes at work people find themselves the object of sexual advances or propositions from supervisors. The advances sometimes involve physical contact and sometimes just involve sexual conversations. Have you experienced such advances?" Analyzing these data (here), it is evident that 3.6% of women attending religious services have found themselves to be the object of sexual advances or propositions from a minister, priest, rabbi, or other clergyperson or religious leader (3.2% of all women). This is the 1 in 33 figure the story notes. Yet using the other question it is also the case that a much larger percentage of women who have been employed, 27.2%, have ever found themselves to be the object of sexual advances or propositions from work supervisors (23.9% of all women). This is on the order of 1 in 4. This is never mentioned in the Washington Post story as a point of comparison. If 1 in 33 is "prevalent" and "pervasive" what is 1 in 4? There appears to be a much greater risk of sexual harassment for women in the workplace than in churches, temples, mosques, and synagogues. The context of misconduct outside of religion could have been included in the Washington Post's story and provided a more realistic yardstick to measure the societal incidence of such behavior. About 26% of women surveyed in the 2008 GSS self-identified as Catholic and thus most of those who did report clergy misconduct were not attending at Catholic churches. However, among Catholic women surveyed, the incidence of misconduct by clergy was similar to the overall findings with 3.6% reporting this from clergy and 24% from a work supervisor. Yet it is also important to note that once one divides the sample by gender and again by religion the margin of sampling error for the sub-group crosses a zero-point for the 3.6% observation (there are 278 Catholic women in the GSS time-series sample analyzed above resulting in a margin of sampling error of +/-5.9 percentage points). If you needed to find a Catholic Mass what would you do? If you said “I’d Google it.” You may be like many other Catholics in the United States—at least on some days. Google dominates the search engine wars, garnering nearly two out of every three searches done on the Internet in the United States. Google Trends (example) provides a window into the search behavior of its users. The search volume for Mass times on Google is always highest the week of Christmas. On average, users are more than twice as likely to be searching for this during that week compared to the average week. If you guessed Easter Week as the next busiest week for this search you would be wrong. Instead it is the week of Ash Wednesday and the beginning of Lent. Holy Days of Obligation that could possibly be abrogated when falling on a Saturday or Monday get more search traffic for Mass times when these fall on other days of the week. However, the Feast of the Assumption is the only Holy Day of Obligation which draws significantly more search traffic for Mass times than in the average week. 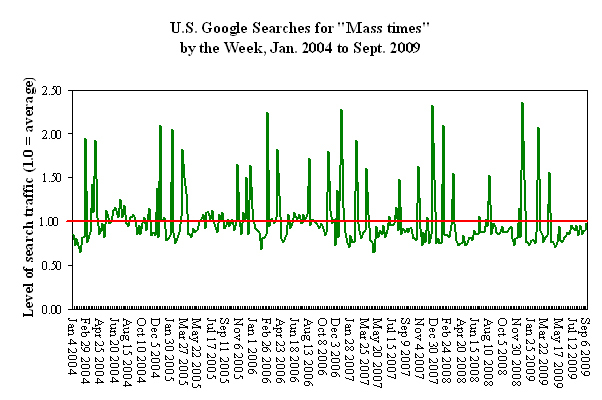 During the January 2004 to September 2009 period, no week matched the week that began on December 21, 2008 for the volume of searches for Mass times (2.4 times as many searches than in the average week). The lowest traffic week during this period was the week beginning on May 6, 2007 (0.6 times as many searches than in the average week). 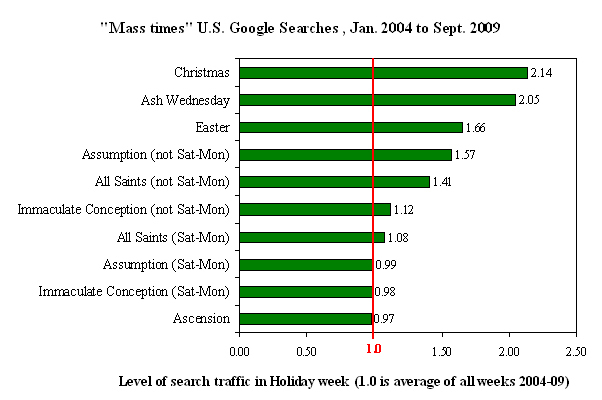 Of the top ten weeks for searches of Mass times all are in weeks for Christmas or Ash Wednesday with the exception of Easter Week in 2004. A recent CARA survey reveals that 86% of young adult Catholics, age 18 to 35, are either married (39%) or say it is at least “somewhat” likely that they will marry in the future (47%). Only one in ten young adult Catholics have never been married and believe it is only “a little” likely that they will in the future. Some 4% say that this is “not at all likely.” Two percent of young adult Catholics have married but are either separated or divorced. Few, less than one in five each, cited their own independence (17%), a lack of willingness to marry from a partner (14%), or negative experiences in relationships (12%), or the negative experiences of relatives or peers who have been married a reason for not having yet married themselves. Two-thirds of married young adult Catholics (66%) have a Catholic spouse. By comparison, 73% of married Catholics older than 35 are married to a Catholic. Among never-married young adult Catholics, only 27% say it is “somewhat” or “very” important to them that a future spouse be Catholic. 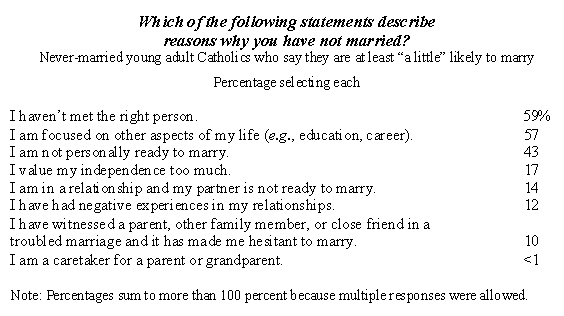 Twenty-six percent say this is only “a little important” and 48% indicate it is “not at all” important to them that their future spouse be Catholic if they were to marry. This does not mean they are actively seeking a non-Catholic spouse and in fact many who do marry will likely wed a Catholic spouse due to social proximity. At the same time, many never-married young adult Catholics do say it is important for them to be married in the Catholic Church. Nearly half (48%) say this is “somewhat” or “very” important to them and 24 percent indicate this is “a little” important to them. Sixty-four percent of married young adult Catholics were either married in the Church (60%) or have had their marriage blessed by the Church (4%). By comparison, 71% of married Catholics older than 35 were married in the Church (66%) or have had their marriage blessed (5%). Young adult Catholics are slightly more likely than older Catholics say they at least “somewhat” believe that marriage is a lifelong commitment (91% compared to 85%). However, they are less likely to believe similarly that marriage as a calling from God (51% compared to 56%) or as a vocation (50% compared to 55%). 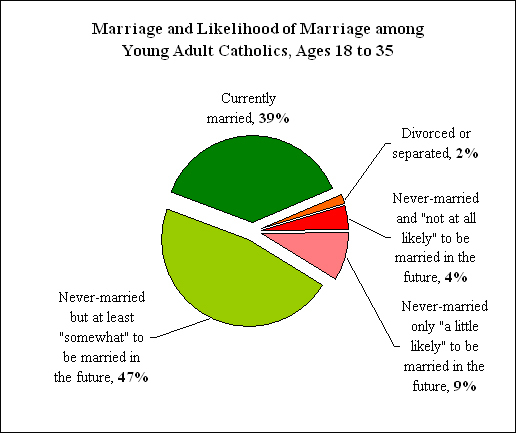 Young adult Catholics have very similar opinions to those of older Catholics regarding the acceptability of divorce. Seventy-six percent of both groups agree with Church teachings that divorce is acceptable in some cases (e.g., the Church does not require one to stay in an abusive relationship). When asked about specific circumstances, young adult Catholics were slightly more likely than older Catholics to believe divorce is acceptable for all of the situations listed. Young adult Catholics are more likely than older Catholics to agree that when they marry they want their spouse to be their soulmate first and foremost (84% compared to 75%) and that couples don’t take marriage seriously enough when divorce is easily available (76% compared to 69%). Young adult Catholics are significantly more likely than older Catholics to agree that living with a partner before marriage decreases the risk of divorce (41% compared to 22%). Eight percent of surveyed young adult Catholics indicated that they are unmarried and currently living with a partner, compared to 4% of older Catholics. How many Catholics read their diocesan newspaper? To better understand readership of diocesan newspapers, a recent CARA Catholic Poll (CCP) asked a national representative sample of self-identifying Catholic adults, “In the last six months have you read your diocesan newspaper?” CARA was able to identify where each respondent lived so this question also included the exact title of their diocesan publication (91% of adult Catholics live in a diocese with a publication. Those who do not were still asked the question but without a specific title). Twenty-five percent of Catholics said they had read their diocesan paper in the last six months. CARA replicated this diocesan newspaper readership question in two additional surveys. Based on this series, CARA estimates that 25% to 30% of adult Catholics read their diocesan newspapers with some regularity. We take the mid-point of this range and assume 27.5% readership. We can understand the meaning of this percentage even more by converting it into population numbers. The U.S. Census Bureau currently estimates the nation’s total population is about 307 million, of which 229 million are age 18 or older. CARA and other academic and media surveys consistently estimate that Catholics make up about 23 percent of the U.S. adult population. Thus, surveys currently estimate an adult Catholic population of 52.7 million. Multiplying 27.5 percent by 52.7 million we can estimate that 14.5 million Catholics—or nearly 5 percent of the total U.S. population—have read a diocesan newspaper or magazine at least once in the last six months. In other words, almost one in 20 U.S. residents has read a diocesan newspaper during this period. This estimate is likely an under-count as CARA surveys do not include interviews with non-Catholics. Given that 16 percent of all adult Catholics are married to a non-Catholic spouse, there is a large pool of potential non-Catholic readers of diocesan papers. In a typical week, this is the number of viewers for a program in the top ten of the U.S. Nielsen Media Research broadcast television ratings. It is about the same as the combined total of all the circulation for the 21 most widely read newspapers in the United States. It is more than the U.S. readership of any magazine not published by the Association for the Advancement of Retired People (AARP). It is 6 million more than the circulation of Reader’s Digest. It is about the same as the number of U.S. monthly visitors to twitter.com. Only 26 music albums/CDs have ever sold more than 14 million copies in the U.S. Skeptics might say they do not trust survey data and that respondents might be lying about their reading behavior. This is a serious issue in survey research often referred to as social desirability bias. This is the tendency for respondents to report a socially desirable behavior to an interviewer because they are ashamed to say they don’t. However, CARA asked this question in surveys conducted with and without an interviewer (respondents answer onscreen) and the results are consistent using either method. Catholics are not ashamed to tell an interviewer that they don’t read their diocesan newspaper. So just who are these 14.5 million Catholics? What does a diocesan newspaper reader look like? 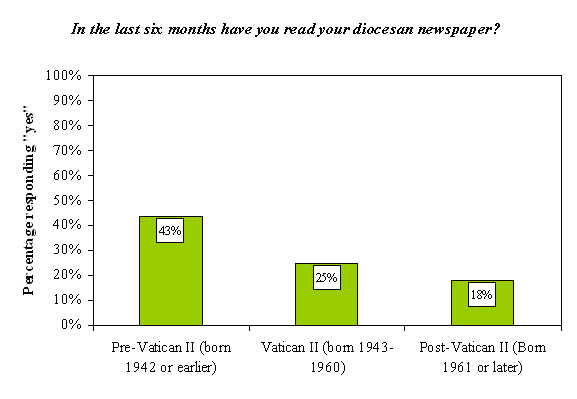 Sub-group differences in readership of diocesan newspapers are strongly related to age and Mass attendance. More than four in ten Pre-Vatican II Catholics have read their diocesan newspaper in the last six months. Only a quarter of Vatican II Catholics have read their paper during this period, as have fewer than one in five Post-Vatican II Catholics. 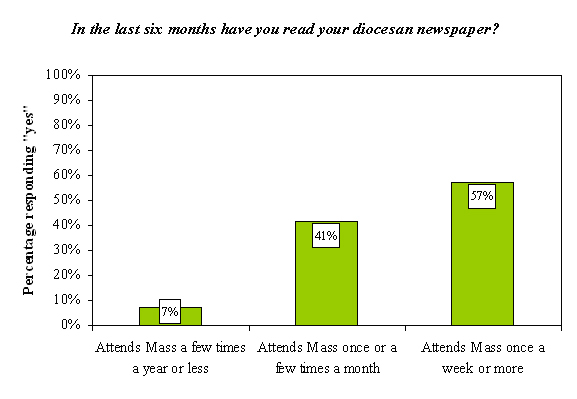 As shown below, Catholics who attend Mass at least once a month are much more likely than those attending less frequently to have read their diocesan paper in the last six months. Nearly six in ten Catholics who attend Mass once a week or more have read their paper in the last six months. Four in ten of those attending at least monthly have done the same. Just 7 percent of those Catholics who attend Mass a few times a year or less often have read their diocesan newspaper in the last half year. There are several other significant sub-groupdifferences. Those who are registered with a parish, who subscribe to a secular daily newspaper, women, those residing in the Midwest and South, and those who have attended a Catholic high school or a Catholic college or university are all more likely to read a diocesan paper than the average Catholic.